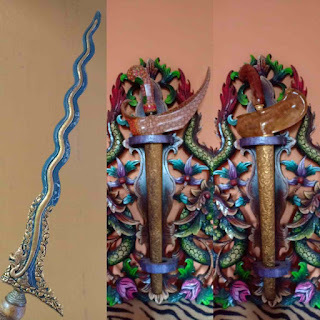 What is KERIS PUSAKA ? The Kris / Keris is an asymmetrical dagger with distinctive blade-patterning archieved through alternating laminations of iron and nickelous iron (pamor). Keris is one of the traditional weapons of Indonesia. Despite of its spread in almost every corner of Indonesia, it can be said that the culture of keris can be found in all regions that once has been under the reign of the kingdom of Majapahit. That is why some culture scholars mention that Keris is the culture of Indonesia. Pusaka is weapon which originated from the ancestors, attain high values, respected and need to be treated specifically. The types of pusaka are Keris, Tombak, Kujang, Rencong, Pedang, Mandau, Badik, Golok atc. Tangguh is an assumed time period when the Pusaka was made. The assumption usually linked with the name of a famous kingdom at the time. Dapur is the process of naming the form or type of a Pusaka, based on the ricikan on the Pusaka and its number of Luk. In the world of keris, the dapur naming has its guidelines called " Pakem Dapur Keris". Pamor is an ornamentor motif on the Pusaka blade. The ornament or motif was made by the technique of metal forging which combined the different metal elements. The consumer come / call the Empu. The consumer making the order of Keris and the Empu will give suggestions. A deal will be made between the consumer and the Empu (concerning the cost and the duration of the making). The Empu will suggest the consumer to do tirakat. The Empu will meditate when he preparing himself mentally before starting the job. The Empu will give instruction to the panjak and vice versa. Penyepuhan ( the Empu usually do the meditation again before penyepuhan). The person who maker the keris is called Pande Keris (Keris Maker). But if he is famous of his skill he bears the name Empu. Empu is a title which given to an artist who has masterpiece works, particularly keris. An Empu who is a keris maker should be an artist who master the art of metal forging. Iron, Stell = is originated from the Eart, which is considered coming from the Mother Eart. Pamor = is originated from the sky, which is considered coming from the Father Sky. Therefore, an Empu who maker Keris, is thought of creating a union between the father sky and the mother eart, a sacred work that is mystical. Keris Ageman, Keris that only emphasizes the physical beauty. Keris Tayuhan, Keris that only emphasizes magical power. Keris Pusaka, Keris that emphasizes both physical beauty and magical power. Cultural art element : Aesthetical value ; can be seen. Supernatural magical element :The X factor ; cannotbe seen but can be felt. 1. Dijamasi or in the other term nyirami, ngawisi, nyuceni, marangi which mean cleaning the Keris. In west java area, the jamasan of Pusaka was done on the month of Maulud. In a safe place (far from the recch of children) and should be put in a closed place, like cabinet. In a respectful place, cannot be put any where. 0 Response to " KERIS IS THE CULTURE OF INDONESIA"